Stick a pin in a global map and you’re likely to strike drought. In a rare combination, droughts are gripping large areas from Australia to South Africa, North America, Asia, Russia, western Europe and even the United Kingdom and Ireland. But National Oceanic and Atmospheric Administration research meteorologist Gerry Bell says he doesn’t see a link. Global drought data does not go back very far, and global rainfall estimates only extend back to about 1980. An international water efficiency standard is being developed at a meeting of the International Organization for Standardization in Australia that can be used across the globe to reduce water use. “Changing populations, new patterns of water use and increasing rainfall variability have led to projections that the world may face a 40% shortfall in water availability by 2030,” Australia’s Assistant Minister for Water Resources Anne Ruston says. The meeting comes as Australia is once again gripped by drought, with the April to June period the fourth-driest period since records commenced in 1900. In New South Wales, in the grip of its worst recorded drought, farmer Les Jones said he would have to shoot all 1,200 of his sheep and bury them on his farm because he has no grass, no water and no money to buy grain. Campaigns are underway in NSW to send hay to stricken farmers. Thousands of bales of hay have been donated along with more than A$1 million. The New Zealand Drought Monitor shows with winter in place, the country is out of drought, but National Institute of Water and Atmospheric Research meteorologist Ben Noll says from January to June this year, record or near-record high mean monthly temperatures were reached 163 times. January was the warmest month on record and New Zealand has not had a month with below average nationwide temperatures since January 2017. Beef + Lamb New Zealand Ltd. chief economist Andrew Burtt says there’s almost always a drought now each summer – somewhere. “The most recent/notable one was in North Canterbury, it lasted for a couple of years …and has had lingering effects since,” he says. Meantime 9,346 km to the northwest, Japan has an unprecedented shortage of water in lakes and reservoirs after unusually low snowfall last winter and a lack of rain since. The eight reservoirs in the Kanto area were at 39% capacity, down from a year-ago 54% and at the lowest level in 25 years. It is reported only severe weather events such as typhoon-driven torrential rains will arrest the trend. “We are observing unprecedented levels of heat in some areas,” a weather agency spokesman tells reporters. In South America, a drought that started in southeast Brazil in 2014, called the worst in 80 years, ended last year. Karl Setzer, Risk Management Team Leader at Iowa-based MaxYield Cooperative, says that at this time there is no major drought being reported in South America. “We are seeing a shift to an El Nino type weather pattern which normally brings favorable growing conditions to South America,” he says. In Western Canada, the area affected by drought continues to improve, but there are still pockets of drought in southern regions. This after a large portion of those southern regions, from the British Columbia Interior to the southeastern Prairies, last year experienced the driest summer in 70 years with less than half the normal rainfall. In the United States, Texas A&M University AgriLife Extension beef cattle specialist Jason Banta wants producers to consider culling options in case drought continues to decrease forage and hay availability. Banta says in a statement drought conditions are also affecting hay availability in other nearby states, including Oklahoma, Kansas, Missouri and Arkansas. The U.S. Drought Monitor shows 85% of Missouri is in some form of drought with 28 northern counties experiencing the most severe conditions. Severe conditions are also expanding into the southern half of Iowa and in Illinois more than 20% of the state is abnormally to moderately dry. Meantime, 40% of Wisconsin and 20% of Minnesota is abnormally dry. More than 20% of South Dakota is abnormal to severely dry. In Ireland, Met Éireann says the little rain the Emerald Isle is getting does nothing to alleviate drought conditions. Farmers are facing grass and water shortages and Agriculture and Food Development Authority crops head Michael Hennessy says barley, wheat and oat yields are predicted to be 26% lower. Other crops such as beans and peas will see yield drops of 50%-70%. NOAA’s Gerry Bell says the drought in Ireland is part of a larger-scale drought pattern that extends across Europe. Another large area of drought is in central Russia. “These two regions are separated by a large area of exceptionally moist conditions in western Russia,” he says. In the United Kingdom, National Farmers Union deputy president Guy Smith says an unprecedented spell of more than 40 days of sunshine and near-record temperatures has grass scorched and turning brown. He says livestock and dairy farmers are dipping into winter fodder supplies and reporting poorer fertility in beef herds. In Sweden, the Lantmännen agricultural cooperative owned by 25,000 farmers predicts the 2018 harvest will dive to 4.2 million tonnes, more than 30% below the five-year average after extreme heat and drought in May and June. The situation looks similar across the entire Baltic Sea area. The Russian Meteorological Service says hot, dry conditions are threatening winter wheat crops in Russia’s southern regions that have not received rain since April. Two-thirds of southern Russia, one of the world’s largest grain producers, is in drought. The European Union’s Joint Research Centre’s (JRC) June report says several countries in the Middle East and Central Asia are suffering from drought. “As a result of the dry conditions that persist since this winter, the productivity of pastures and rain-fed cereals is clearly reduced in much of Central Asia, including Afghanistan, Turkmenistan, Uzbekistan, and Tajikistan,” the JRC says. In southern Africa, it says, production expectations are below average in southern Madagascar and in regions that experienced a major dry spell early in the season, including southern Mozambique, southern Malawi, Lesotho, southern Zimbabwe and southern Zambia. 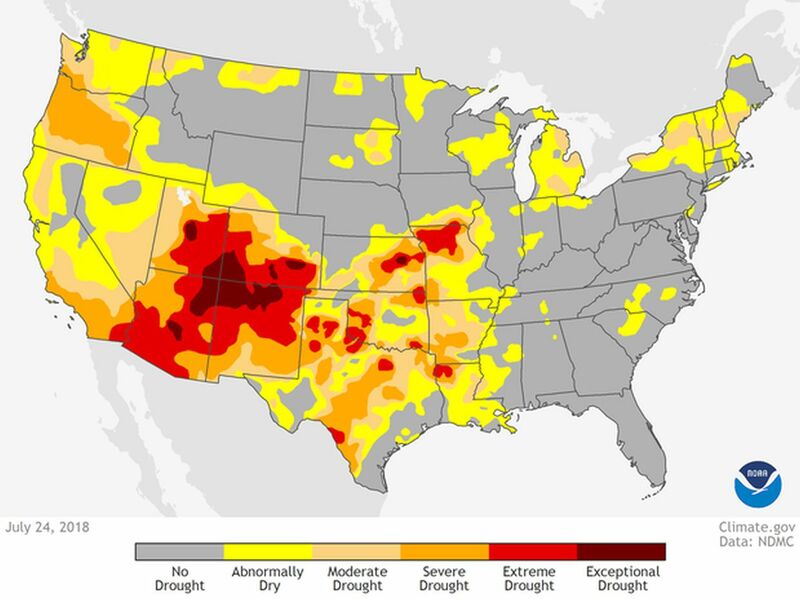 A JRC technical report found the massive water shortage, while exceptional, is characteristic of longer-term weather patterns. With climate change spurring more and more extreme weather events, severe shortages could become an increasingly regular occurrence, it says. JRC scientists looked at precipitation in southern Africa over the past 36 years and found a strong probability of a 50%-70% monthly precipitation deficit every five years. In the Western Cape, the deficit could reach as high as 70%-80% every 10 years. In South Africa, Farmers Weekly Editor Denene Erasmus, in a poignant letter to farmers in the country’s drought-stricken regions, says anyone who has grown up on a farm knows the excruciating helplessness of looking out over parched veld or crops and watching rain fall from heavy clouds on another family’s farm. Erasmus says her recent memories of the family farm are largely filled with anxiety and tension as November, and then December, and then January arrived without bringing rain. “Drought, I have now learnt, brings with it its own violent silence,” she wrote.